On Wednesday, Apple announced that multiplayer games on your iPhone and iPod touch will never be the same. At a press event, Apple CEO Steve Jobs unveiled the company’s highly-anticipated Game Center. As part of the iOS 4.1 update, Game Center will be available as a free download next week. Game Center is both a set of APIs for developers and an app on your iPhone. In practical terms, Game Center will allow developers to better implement multiplayer into their games and players will now be able to easily challenge their friends to matches. Cumbersome leader boards are a thing of the past; other iPhone social networking systems, like OpenFeint, could be obsolete after Game Center is released. Game Center demonstrates Apple’s surprising mastery of the social space. Not only can you challenge your friends or your friends challenge you, but Game Center will “auto-match” you “if you don’t have any friends,” Jobs explained. You can compare scores and discover new games your friends are playing. Not only will Game Center make great games easier to find, but there will be new social features for gamers to utilize such as notifications, streaming video, leader boards, and stats. Developers can look forward to get more promotion for their games, and players can more easily learn about these games from their friends’ recommendations. In a surprise move on Wednesday, Epic Games’ President Mike Capps strolled onto the stage to announce “Code name: Project Sword.” Epic Games is a big player in the gaming world, having developed the exceptionally successful Gears of War series for the Xbox 360. To have such a high-end gaming developer on stage with Steve Jobs is yet another sign that Apple is taking gaming seriously. Capps demonstrated Epic Games’ first title for the GameCenter, a fantasy-based role-playing game featuring “epic sword battles” and created using the Unreal Tournament engine. During the demonstration, Mr. Capps explained that all the social integration in the game is done for the company by Game Center—the game just pops an invitation and players can quickly select their friends and play. 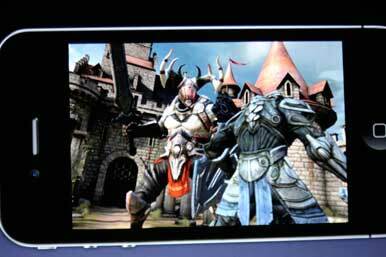 Epic Games performed a demonstration of Project Sword at an Apple event on Wednesday. iOS 4.1 and the Game Center feature, will be available as a free download on iTunes the week of September 7. Gaming will never be the same.